Partially inspired by one of Rachel Allen’s programmes I was half-watching, I had a yen to experiment with some pastry as I’ve never really made it before. I thought I’d start with the simplest, which is short crust. The principle with short crust is that fat should be half the weight of the starch in the mixture. So if you use 200g of (plain) flour, then you need 100g of fat. And for every 200g of flour you need roughly half a beaten egg. I use, at my mother’s suggestion, though Nigella concurs, a mixture of Stork margarine / butter and vegetable shortening (I use Trex but Crisco is much of a muchness). You could use entirely the latter for vegan pastry, but you’d probably have to be even more restrained with the egg as Trex is more damp than butter. For 30 of these (using two silicon tarlet tins of 15 each), I used 300g of plain, 00 flour, 75g of Stork and 75g of Trex. The fat and flour go into a food processor and are quickly pulsed to make damp sand (or rubbed together with fingers if you’re without electrical aid). I guessed at pre-heating the oven fortuitously accurately. For little pats of pastry like these, around 150 degrees Celsius is fine. For sweet pastry you can add one tablespoon of icing (confectioner’s) sugar, or a teaspoon of fructose for diabetic-friendly cakes. For savoury, a teaspoon of salt will do nicely. Or you could add nothing at all – I’ve forgetfully done that before and it still makes for lovely, buttery pastry. A little of the beaten egg is poured in at a time and it’s pulsed / combined until it just combines; the pastry shouldn’t be too damp. I found I used just over one, but it will vary so best to just add a little at a time. Once you can just about bring it together, wrap it up tight in clingfilm and pop it in the fridge for at least 30 minutes. In dire straits, Ms. Allen says the freezer for 15 will do. It makes it far more workable. Roll it out between two sheets of clingfilm and use a cookie cutter just wider than the tarlet cases. 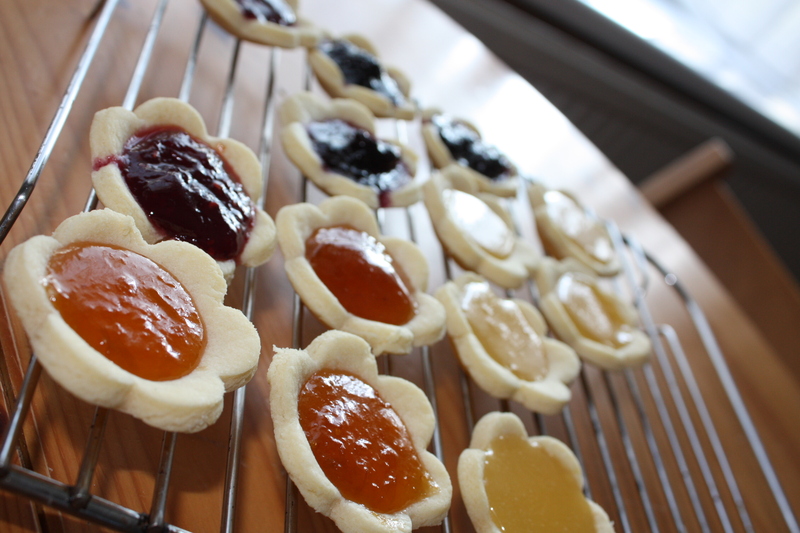 Stamp out your shapes and pop them into the tartlet tins, pushing down gently to form a dip. Then drop around half a teaspoon’s worth of the jam of your choice into the dip – a no-sugar-added version if necessary. Don’t be tempted to overfill – some of the ones in the picture are slightly too generous and it upsets the nice pastry to sweetness ratio if you overdo it. The jam heats up and becomes rather runny, spreading to become a fetching jewel in the middle. I also used lemon curd which tastes wonderful but needs a lot longer to set after heating. Eight to ten minutes is ample; the pastry might still look quite pale but it will be quite a dry texture already, and firm up more as it cools. Half an hour to cool… and then a yummy tea time. Very simple, very quick, generally made from storecupboard ingredients and pleasing to everyone from kids (who can easily help to make them) to grannies. Love it.